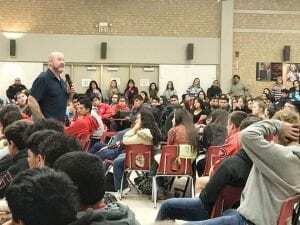 Motivational teen speaker, Jeff Yalden, speaks to the Jourdanton High School students and staff about the importance of mental health. “The hardest person to get to know is yourself.” – Jeff Yalden. On Thursday, Nov. 15, Jourdanton ISD welcomed Jeff Yalden to the campus to speak to the students, staff and community. Yalden is a teen motivational speaker who has spread his message across all 50 states and parts of Canada. He has addressed thousands of middle and high schools to talk to teens about life, and Jourdanton was honored to hear his incredible words. Yalden spoke of his upbringing and troubles as a teen and young adult to JISD students and staff. He was a an excellent athlete in high school, but didn’t focus on grades. When he applied for college, only three of the 19 schools he applied to accepted him and he lost all interest in school, life and himself. He went into the United States Marine Corps, but after suffering from traumatic experiences, PTSD and other mental health issues, he was honorably discharged. From this, he described the importance of mental health, especially for teens. He explained that it is “okay to not be okay,” and that teens should always have a trusted adult to talk to. Sometimes people just need to talk about their feelings and let it out, which led him to speak about therapy sessions and counseling. He emphasized that finding help is important and if someone needs it, all they have to do is ask. To bring his talk to an end, Yalden told the students that if anyone wanted to speak with him privately, he would be available for the day and reminded them that things will eventually be okay. The students and staff at JISD were honored to hear his speech and many shook hands with him and thanked him for his advice and time. Yalden spoke at three different sessions at JISD. He spoke to the high school and junior high students separately during the school day and then the community that same evening. Jourdanton ISD is thankful people were able to hear such inspirational words and hopes students gained a better understanding of mental health.